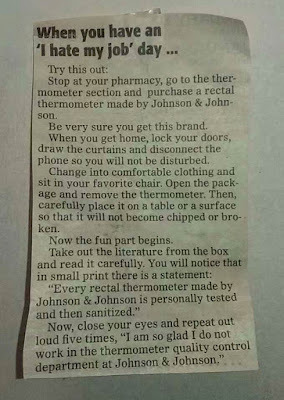 Stop at your pharmacy, go to the thermometer section and buy a rectal thermometer made by Johnson & Johnson. Be very sure you get this brand. Change into comfortable clothing and sit in your favourite chair. Open the package and remove the thermometer. Then, carefully place it on a table or a surface so that it will not become chipped or broken. Take out the literature from the box and read it carefully. You will notice that in small print there is a statement: "Every rectal thermometer made by Johnson & Johnson is personally tested and then sanitised." 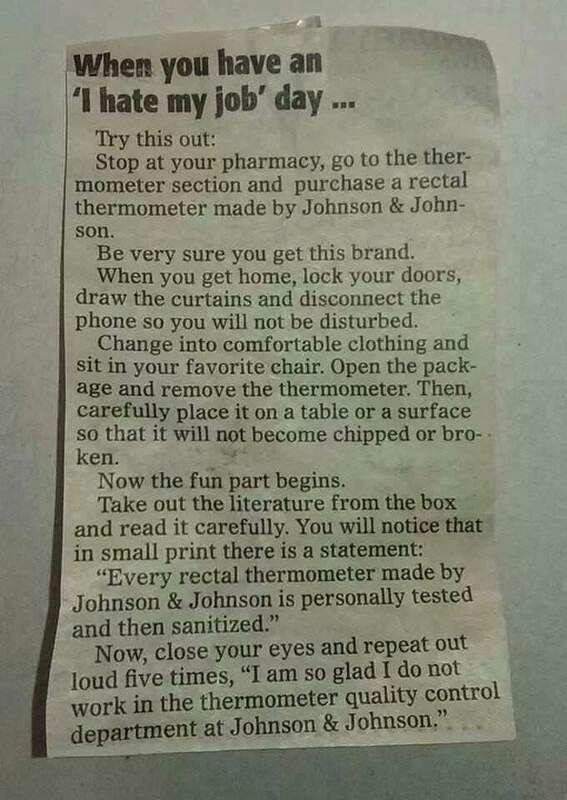 Now, close your eyes and repeat out loud five times, "I am so glad I do not work in the thermometer quality control department at Johnson & Johnson..."